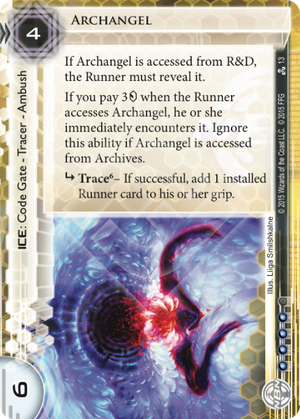 If you pay 3credit when the Runner accesses Archangel, he or she immediately encounters it. Ignore this ability if Archangel is accessed from Archives. subroutine Trace – If successful, add 1 installed Runner card to his or her grip. Be a little careful rezzing this card against Noise: Hacker Extraordinaire, especially on R&D. There is no 'may' clause to the sub, which means the corp has to return an installed card, even if you've bounced his entire rig except for his last Cache. Hopefully I never make this mistake again, as I was milled hard while my opponent giggled and set up a pile of credits while continuing to access and mill. Did I mention how he milled me constantly? He wanted to make sure I didn't draw another IE to replace this guy with. It wasn't worth it to bounce a Medium. Otherwise this card has saved my bacon on many occasions and is a powerful run deterrent to most runners. But screw Nosie. This is a very taxing card for the runner indeed. If the subroutine is not broken then they would suffer a major tempo hit, potentially losing an expensive card back to hand. It also offers NBN a relatively cheap, efficient and taxing piece of ice to add to its repertoire. Rush and kill decks both would benefit from its inclusion. However, it is a weak early game piece of ice because the runner could be running without any cards in play, thereby nullifying its impact. So if it is installed early, do not rez it until its subroutine will do some major tempo damage. Regarding the R&D access option, consider the cost/benefit of activating the ice in relation to the current credit differential between yourself and the runner. It would cost you 3 credits to activate it, but the cost to the runner could be much more than this. However, the rez cost is just 4 credits once on the table, so many times you may opt not to activate it from R&D. If you can rez this ice at a point where the runner has a lot of cards installed, and does not have a cheap way of breaking the subroutine, then this card is sure to reap a solid dividend. As a Prepaid VoicePAD Kate "Mac" McCaffrey: Digital Tinker runner, I really find this ice to be a major problem these days! Archangel on the outside of a server, to force the corp to break or beat the trace, otherwise you bounce their breaker for the inside ICE. It's quite taxing to break, except with D4v1d. The trace is quite strong, so everyone who isn't running a Security Nexus build will probably pay 4-6. And for only 4 to rez! Bounce other cards the runner needs during or just after a run. Self-modifying Code, Plascrete Carapace or Clone Chip perhaps. Messing up runner cards with counters (virus/power/credits) like Kati Jones or Medium. That taxes the runner a mixture of and . The trick I've missed so far is to just hold an Archangel in hand. If you can afford to trigger it multiple times, it can be a major annoyance for the runner. This is especially useful if HQ isn't very secure, inviting friendly runners for multiple visits. As an Ambush it is very difficult to trash. Typically an Imp or similar would be required. Using Archangel like this is relatively costly, but can generate a differential. I can't believe how cheap Archangel is to rez. This does seem like a direct response to the popular combo with Off-Campus Apartment, Fall Guy and Wireless Net Pavilion, since add card to grip completely bypasses the trash effects otherwise preventing you from trashing those resources.